Those of you asking if 9mobile 1GB for N200 is still working, the answer is yes, it is working and rocking. Its weekend and 9mobile want you to groove your weekend with superfast internet hence giving you this mouthwatering offer. 4.5GB for N500. How many days will it take you to exhaust 9mobile 4.5GB data? 5day, 15days or 30days? 9mobile assumed that this mouthwatering offer should take you only 5 days to exhaust, hence capping it with 5 days validity. 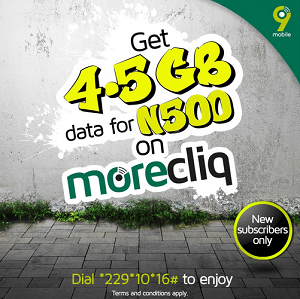 How Can I get 9mobile 4.5GB offer? Dial *229*10*16# for 4.5gb. This one-off data offer is valid for 5days.